Provide comfort for the family of Thelma Webb with a meaningful gesture of sympathy. 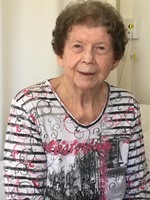 Thelma Irene Webb, age 88 of Paisley, passed away Thursday, April 4, 2019. Predeceased by her husband Alvin Webb in 2002, and her parents Ambrose and Isobel McFadden. Friends and relatives are invited for visitation from 10:00 a.m. to 11:00 a.m. on Monday, April 8, 2019 at Cameron Funeral Home, Walkerton, with a service starting at 11:00 a.m. Rev. David Williams officiating. Spring Interment in Purdy Cemetery.